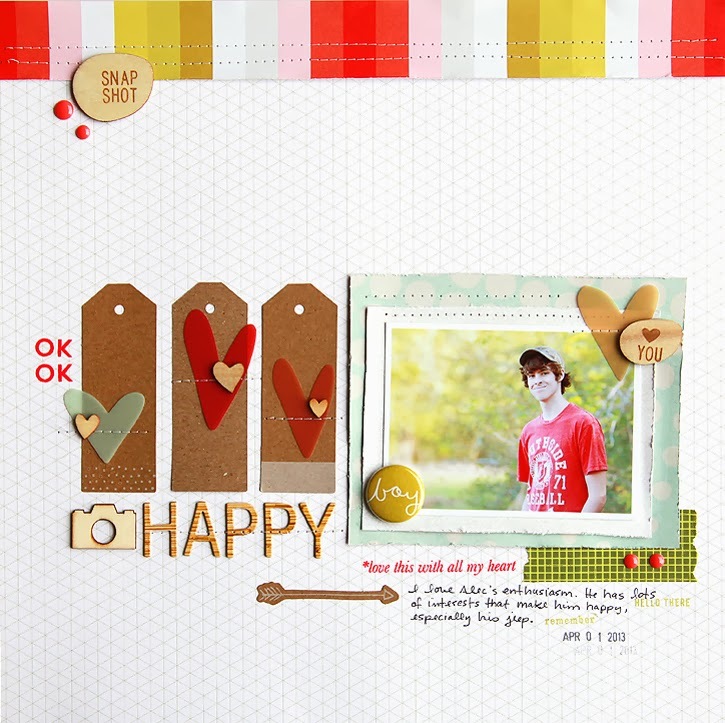 For the past few days I've been doing lots of scrapbooking with the Studio Calico Sugar Rush scrapbook kit. This is why I am only on one creative team this year - I wanted to have lots of time to scrapbook for me! Who would have thought that a mom of two boys who doesn't even like pink would LOVE this kit so much!! Honestly, that striped paper made by Studio Calico may be my favorite patterned paper ever and this kit is FULL of amazing embellishments like those hearts and the kraft die cut shapes. First, here's a look at the gorgeous kit that I worked with. It's still available for purchase here. 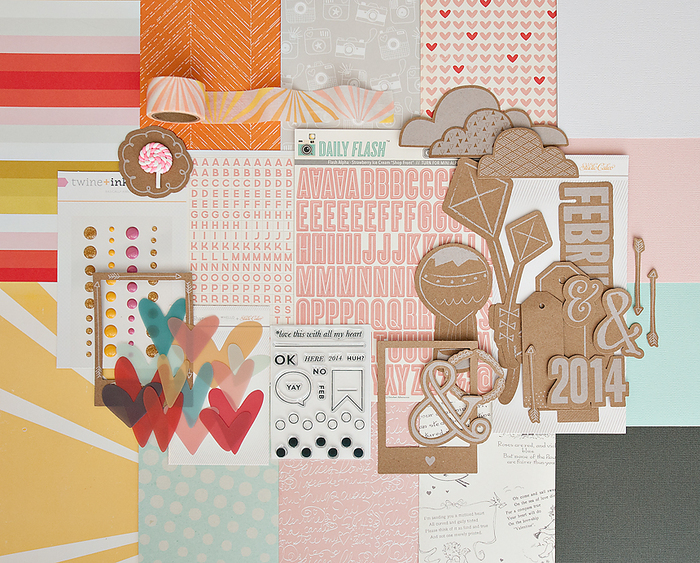 And if you love that striped paper as much as I do, you can still purchase the SC patterned paper from February here. I made five layouts with the Sugar Rush kit, and only added in a few things from my stash, mainly some wood veneer and alphas. I scrapped photos mostly from the past year, but also one very old photo - it's me when I was one week old! I wanted to be sure and use the kraft die cut clouds and kite and the pink heart paper, and they seemed perfect for a baby layout to me. The documented stamp is from the Sugar Rush Project Life kit, and I stamped it with Color Theory Blush Crush. However, I have no problem with using a little pink on my boy layouts as you can see. There's that striped paper again, this time framed because it really is that awesome!! I stamped the arrows with Color Theory Well Red. I've been wanting to scrap this photo of my very first Studio Calico Project Life kit, and this kit complemented the photo perfectly. The "hello" is a Lawn Fawn die (cut out of my favorite paper again)! I wanted to document this photo that I love of Alec, and journal about his enthusiasm for life. He's the kind of guy with lots of interests, and he is never bored. And finally, I scrapbooked this sweet photo of Mason and his date before the homecoming dance last month. 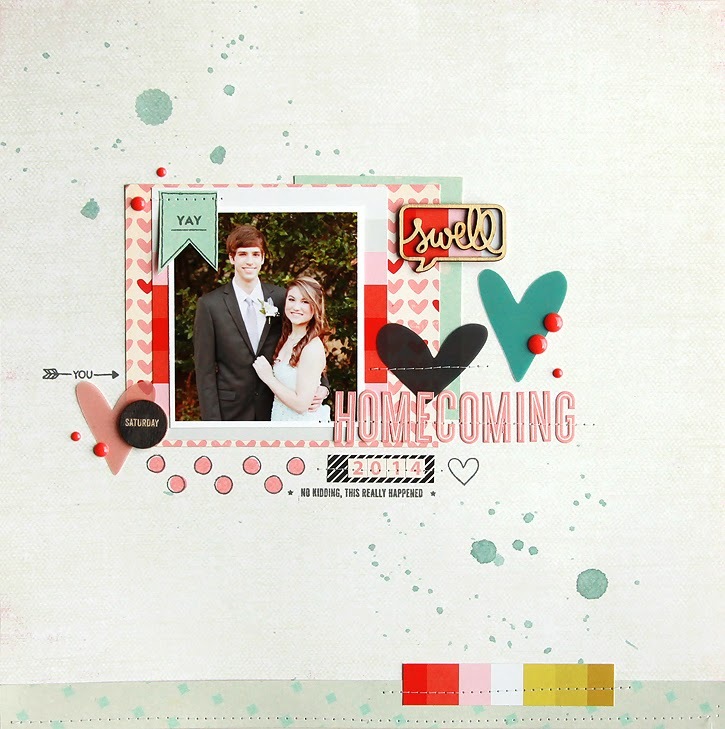 I stamped the cute dots from the scrapbook kit stamp with Color Theory Blush Crush ink. I used Bazinga mist for some paint splatters. My favorite way to scrap is with my Studio Calico kits. SC has a way of putting together a gorgeous kit that goes together perfectly, without being too matchy. Plus they have the most wonderful stamps every month. If you would like to subscribe to one of Studio Calico's kits, scroll to the bottom of this page. You can check out the current month's kits here. Gorgeous layouts my friend! If I wasn't already a subscriber I would be after reading this. Love all of it! Love the first and last one the most. The misting is cool on the last one. Amazing job Deb!!! I am in the same boat with 2 boys and not loving pink. THis is so inspirational!!! These are all fantastic! Love the bold colors and the layering. Deb, you sure make pretty projects. Thanks for posting and sharing such inspiration. I love your work! I follow your blog because I have two boys about the same age. 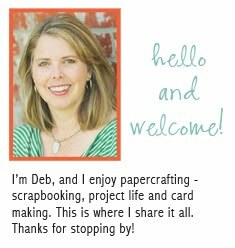 I scraplift your work often! Awesome pages!! Love the colors (and that striped paper is fabulous!) and every single design!! Beautiful pages, Deb. Super cute as Emma would say. Your boys are so cute and handsome and that baby one is adorable!